Your search is over! This home has a new deck in back plus a covered tile floor porch...not to mention the perfect rocking chair front porch. 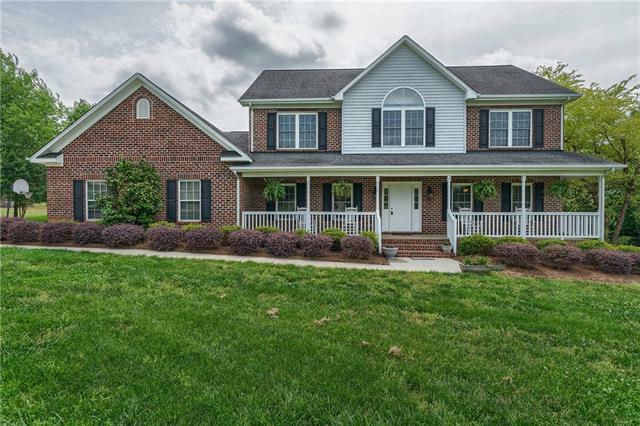 This four bedroom, two and a half bath home features a large kitchen, dining room, living room and den with a gas log fireplace, plus an office on the main level and is situated on a level 1.29 acre private lot on a low traffic cul-de-sac. Also has a detached workshop/storage building which is wired for electricity in addition to an oversized double garage. Features new granite, sink, faucet, stainless stove, dishwasher and microwave. Refinished hardwood floors, just painted inside and out. HVAC and water heater new in 2017. Established, private neighborhood but convenient to all major roads. Won't last long!